Unfortunately, you may have trouble accessing our Shooters Forum during the next 24 hours. The third-party that hosts our forum, Website Toolbox, is installing a master “back-end” software upgrade today. Predictably, something went wrong with the upgrade and access to the Forum may be sporadic today. Please don’t freak out. This is something that should be resolved shortly, and YES we know there’s a problem. Share the post "Forum Access Problems — Software Glitches Today"
Frank Green at Bartlein Barrels has announced that custom stocks can be painted by a member of the Bartlein “team”, Terry Bartlein, (aka “Squirt”). Terry can produce a wide variety of stock finishes and effects, including metallics, fades, gradient shifts, plus graphics, flames, and lettering. Terry is very talented. He owned his own body shop for 20 years and he really liked doing custom paint work on motorcycles. He has painted everything from cars to bikes to gun stocks. He’s even custom-painted refrigerators and mail boxes. If you want to have your stock painted by “Squirt”, contact Terry at Bartlein Barrrels, (262) 649-1574, or email Terry at squirt-bartlein [at] sbcglobal.net . Share the post "Bartlein Family Offers Stock Painting"
Randy Robinett, maker of the popular and super-accurate BIB bullets, now has an updated website. With a little help from Ryan Ware and the folks at the BenchTalk Forum, Randy has expanded his website to include very comprehensive information on all the bullets he produces. 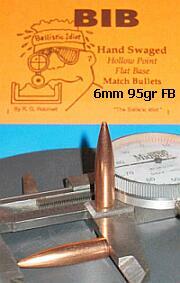 6mm – 65gr FB, BC = .27. Made in Niemi carbide dies, 8.5 ogive/.055″ meplat, .2435 pressure ring; .2433 shank: a 1:14″ twist is ideal. 6mm – 67.0gr FB, BC = .28. Made in Niemi carbide dies, 8.5 ogive/.055″ meplat, .2435 pressure ring; .2433 shank: ideal twist for the 67gr FB is 1:13.5″. 6mm – 95gr FB, BC = .45. Made in Niemi carbide dies; 11 ogive/.052″ meplat; .2435 pressure-ring; .2433″ shank. Ideal twist: 1:10″ twist; works well in twist rates as fast as 1:8″. 6mm – 108gr FB, BC = .51. Made in Niemi carbide dies; 11 ogive/.052″ meplat; .2435 pressure-ring; .2433″ shank. Ideal twist rate: 1:9″; faster twists not recommended. For more information on Robinett’s .22, .25, 6mm, and 30-Caliber bullets, visit www.BIBullets.com. You can also email Randy at bibrob [at] netins.net, or phone him at (515) 438-4010. Share the post "Robinett Has New Website for BIB Bullets"